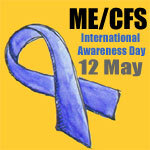 In May 2010 we’re asking you to blog for ME/CFS Awareness. If you don’t usually blog about your health or the health of someone you know please don’t let this put you off from blogging about it in May. Your post can help us raise awareness amongst an audience who may not usually hear about this group of conditions. If you are going to blog for ME/CFS Awareness this May we would like to add you to our list of Participants for 2010. Here you can see an up to date list of bloggers and during May we’ll add their posts there too. As well as blogging there’s also a list of ideas and links for What You Can Do to raise awareness of ME/CFS. An awareness and fundraising walk is being held on May 23 2009 by Patient Alliance for Neuroendocrineimmune Disorders Organization for Research & Advocacy or P.A.N.D.O.R.A. Walk with P.A.N.D.O.R.A to benefit children, men and women stricken with Neuroendocrineimmune Disorders such as: chronic fatigue syndrome/ME (CFS/ME), fibromyalgia (FM), Gulf War illnesses (GWI), multiple chemical sensitivities (MCS) or environmental illnesses (EI) and chronic Lyme disease (CLD). Your participation supports research that can lead to scientific breakthroughs, physician training, scholarships for the chronically ill, quality of life outreach programs and advocacy initiatives. There is a 5k and a 1 mile walk on the day and the registration fee includes lunch. This fundraising event will go towards PANDORA‘s key missions. To be one strong voice for many© . . .